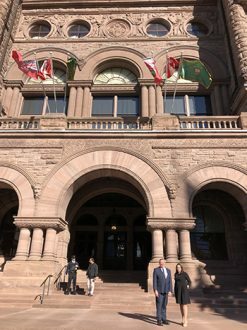 AMHO Board President Vaughan Dowie and CEO Adrienne Spafford before going into Queen’s Park to present to the Standing Committe on Social Policy. Last week, Addictions and Mental Health Ontario’s CEO Adrienne Spafford and Board President Vaughan Dowie presented to the Standing Committee on Social Policy for the consideration of Bill 36, Cannabis Statute Law Amendment Act, 2018. Virtually every one of AMHO’s 200+ members across the province encounter the impact of cannabis use every day. Our members provide addiction treatment designed to address the harms associated with substance misuse and promote healthy lifestyles. Our members also provide mental health supports for Ontarians with psychosis, where there is a known link for youth between chronic cannabis use and onset among those with a family history. AMHO’s main message to government is straightforward: use evidence to address the demonstrated harms associated with cannabis use, including cannabis dependence and associated mental health issues. The legalization of cannabis is a unique opportunity to treat cannabis-related harms as a health issue rather than a criminal issue. AMHO and our members look forward to working with the government as they move forward with cannabis legalization to ensure an approach that will minimize harms and put health first.